While I was at the store picking up my Devil May Cry 4 Collector’s Edition I pre-ordered several other new games including Condemned 2: Bloodshot and Turning Point: Fall of Liberty Collector’s Edition, among a few other titles. In any case it would appear that my Gamestop received their pre-order bonus content in early for both Condemned and Turning point as I was treated to some items for those games. 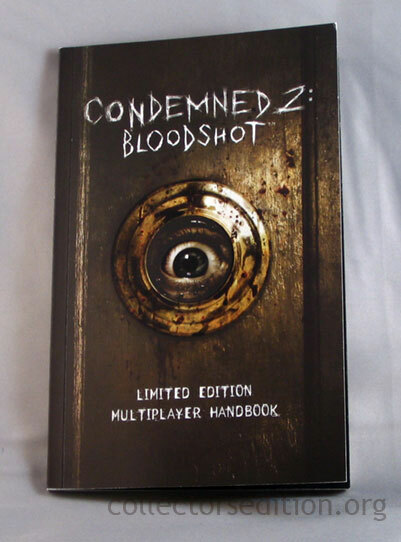 While Condemned 2: Bloodshot wont be coming in any special trim (shame really) Gamestop’s pre-order bonus is a “Limited Edition Multiplayer Handbook”. 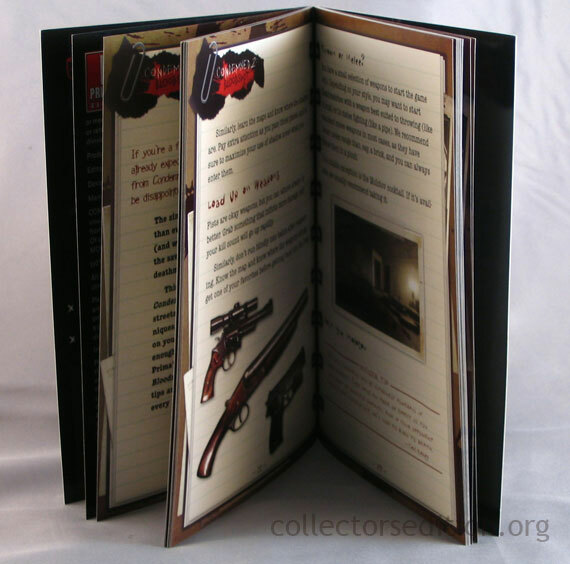 This handbook is limited in the same way fun-sized candy bars are actually fun. Regardless, the book features nice glossy print and some game art accompanying the “strategy”; it gives me something interesting to read about the game while I wait for it’s release. Far be it from me to look a gift horse in the mouth. 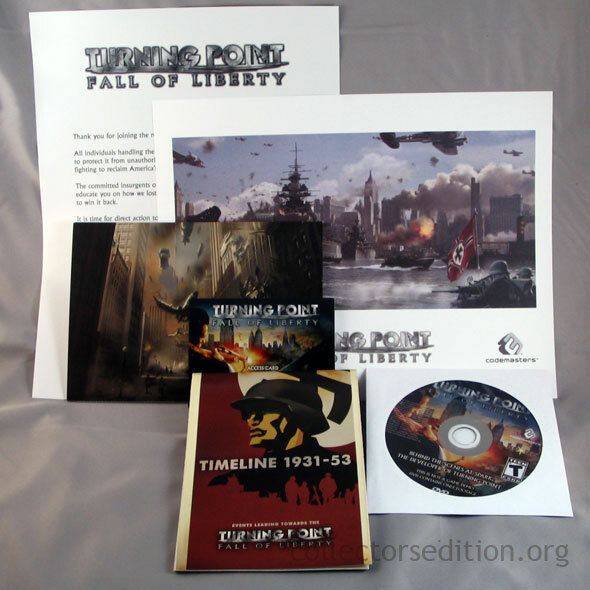 I was actually quite surprised with what I got for Turning Point: Fall of Liberty. A large sealed envelope with the games name on it. I liked the idea of the envelope, like a top-secret document of sorts. Though it’s presentation was rather cheesy, the contents of the envelope impressed me immensely. 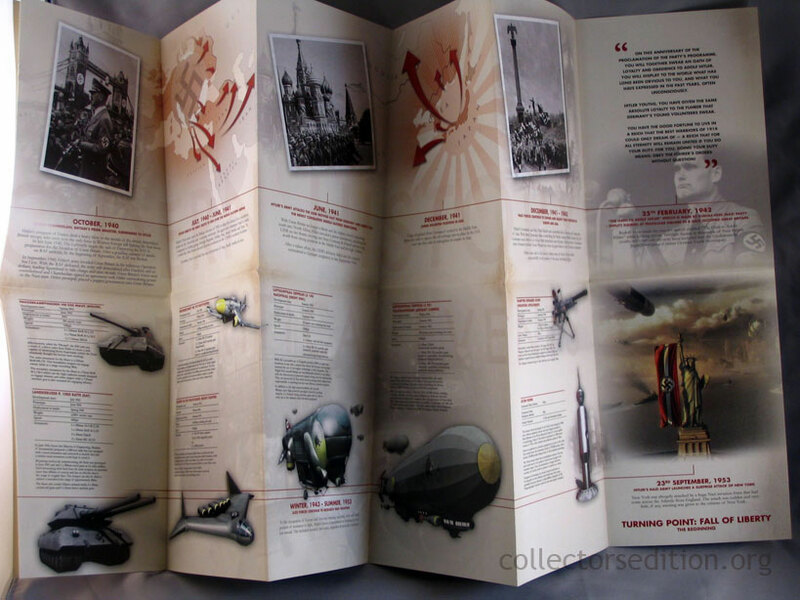 Inside was a “welcome to the resistance” letter, a letter sized lithography with some game art on it, five high quality post cards with some really nice game art, a large fold out two sided poster with an alternative history timeline explaining the games back story on one side and some more game art on the other, a bonus DVD with a behind the scenes/making of documentary, and a card with a code on it that will presumably unlock some bonus game content. I was really quite impressed considering that all of this was essentially free just for agreeing to purchase the game. The game is a Collector’s Edition too, and one that will only cost and extra $5 over the retail price of the regular edition. The game seems interesting enough but I’m curious if the bonus content with the game will match that of the pre-order pack. 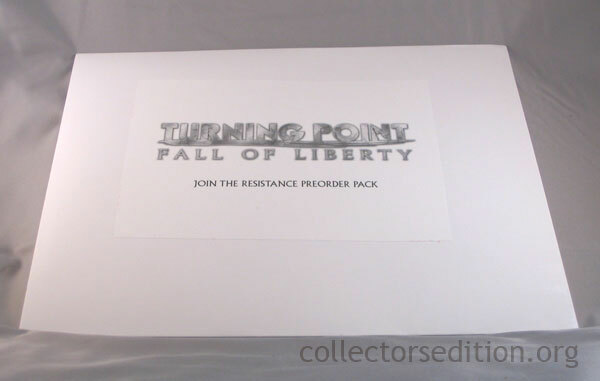 I think the pre-order pack for Turning Point does a lot to really bring you into the game’s world. If this is a game you’re thinking about buying you owe it to yourself to pre-order it and get one of these packages, it’s well worth it.